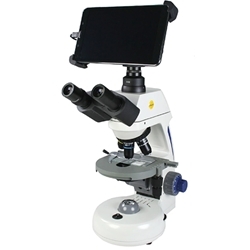 The Swift M10T-BTW1 digital trinocular tablet microscopes offer a 5 mega pixel integrated digital camera with a 8" LCD screen. Images and video files can be captured directly onto an SD card without the need for a computer. The LCD screen allows easy viewing of specimen and materials between lab partners sharing the microscope. The WiFi digital tablet transmits live images to iOS or Android devices. Share live images with the class using WiFi tablets, wireless laptops, and HD-ready LCD monitors or projectors through HDMI. Objective Lenses: Reversed quadruple nosepiece includes DIN standard 4x, 10x, 40xr and 100xr semi-plan or plan achromat objective lenses (select when ordering). All objectives are parfocaled, parcentered and color-coded. Eyepieces: Trinocular head with widefield 10x eyepiece with 20mm field of view. Diopter and interpupillary adjustment from 54mm - 76mm. Accepts 21mm diameter reticle, retaining ring required. Total Magnification: 40x, 100x, 400x, 1000x magnification. Condenser: Abbe 1.25 NA condenser with rack and pinion focusing and iris diaphragm. Specimen Stage: Large 5.75" x 5.5" (142mm x 140mm) stage with a built-in, low profile ball-bearing mounted mechanical specimen holder with low-position coaxial controls. Illumination: Variable 3w LED illumination is a cool, energy efficient light that lasts up to 50,000 hrs. 110V~220V switching power supply. Size & Weight: 14.5" (369mm) H x 10.25" (261mm) D x 6.75" (172mm) W, 31 lbs (14 kgs). Warranty: Swift Optical lifetime limited warranty covers defective parts and workmanship for the life of the instrument. 8" LCD screen with 1280x800 16:9 pixels resolution. 5mp Camera and captured resolution to SD card. Includes Motic Images software that can be used to edit, measure and annotate saved images. WiFi supporting both hot-spot mode or using existing WiFi Network. Share real-time images with multiple mobile devices.